Herbal Medicine is an interdisciplinary branch between Herbal Medicine and Ayurveda and it covers all the fields of Herbal Medicine related to Botany, Medicinal Plant Research, Pharmacognosy, Phytochemistry, Phytotherapy, botanical medicines, Ayurveda and Natural chemistry, Agriculture Science, Unani Medicine, Biotechnology and Biochemistry. 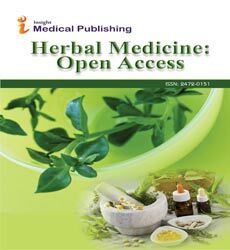 Herbal Medicine is an open access journal and the main aim of this journal to provide a platform for scientists, researchers in Herbal medicine and Ayurveda fields all over the world to present their new ideas, discuss new strategies, and promote developments in all areas of Herbal Medicine. The Journal is intended to be comprehensive, and its main aim is to publish all the papers related to Herbal Medicine and Ayurveda. Herbal Medicine Journal is at higher echelons that enhance the intelligence and information dissemination on topics closely related to Herbal Products. The Journal provides a unique forum dedicated to scientists to express their research articles, review articles, case reports and short communications on an array of Herbal Medicine research. Abstracts and full texts of all articles published by Herbal Medicine Journal are freely accessible to everyone immediately after publication. The Journal is using Editorial Manager System for quality in peer review process. Editorial Manager is an online manuscript submission and review system. Review processing is performed by the Editorial Board members of Herbal Medicine or outside experts; at least two independent reviewers approval followed by editor approval is required for acceptance of any citable manuscript. Authors may submit manuscripts and track their progress through the system, hopefully to publication. Reviewers can download manuscripts and submit their opinions to the editor. Editors can manage the whole submission/review/revise/publish process. Botanical science is a branch of biology which deals with the scientific study of the physiology, structure, genetics, ecology, distribution, classification, and economic importance of plants along with plant life of particular region, habitat, or geological period. Plants include algae, fungi, lichens, mosses, ferns, flowering plants, etc. A botanist or plant scientist is a scientist who specializes in this field of botany. Botanical science journal Deals with complete plants studies. Plant Pathology & Microbiology, Experimental Botany, Botany, Medicinal Plants, Plant Biochemistry Physiology, Annals of Botany. Henna is a reddish-brown or reddish-orange dye made from the Old World shrub Lawsonia inermis (family- lythraceae), which produces henna with small pink, red, or white flowers. Henna is used to colour the hair and temporary body art known as mehndi. The dye is extracted from the dried leaf and petioles of the plant. Botanical science journal Deals with complete plants studies. Pharmacognosy & Natural Products, Anti Cancer Potency of Henna, Herbal Medicine, Henna. Ayurveda is a Sanskrit word meaning ayus means life and vela means knowledge of life, is the traditional Hindu system of medicine which uses diet, herbal treatment and yogic breathing. Ayurveda is based on maintaining balance among earth, air, water, fire and ether. Ayurveda maintains health by maintaining equilibrium with nature between individual’s body, mind and spirit. Ayurveda is the oldest form of health care in the world. Ayurveda journals deals with Herbal treatment and diseases. Ayurvedic Medicine, Alternative Medicine, Natural Medicine, Natural Products Chemistry & Research, Herbal Medicine: Open Access. Herbal are the medicines that includes herbs, herbal medicines, herbal preparations and finished herbal products which contains active ingredient as part of plants and its combinations. A person who deals with herbs especially medicinal herbs are known as herbalist. Herbal journals deals with use of plant in the treatment of diseases. Herbal Medicine, Medicinal Plants, Natural Products Chemistry & Research, Herbal Medicine: Open Access, Traditional Medicine & Clinical Naturopathy, Pharmacognosy and Natural Products. Herbs are any plant or a part of a plant that are used for medicine, food, flavoring or perfume. Herb consists of flower buds, bark, seeds, leaves or any other parts of the plants. Examples of herbs are ginsing, chamomile, basil, thyme, etc. Herbs journals deals with complete details of plants used on medicine. Traditional Medicine & Clinical Naturopathy, Medicinal herbs, Green and Herbal Chemistry, Herbal Drugs, Herbal Medicine. Phytochemicals are non-essential nutritive plant material that consists of protective and disease preventive properties. They are found in fruits, vegetables, grains and other parts of the plant. There are number of Phytochemicals each work differently. Few of the functions of phytochemicals are antioxidant, hormonal action, anti-bacterial effect, etc. most of the food contains Phytochemicals except foods such as sugar and alcohol. Phytochemicals journals covers the topics related to nutritive plant material. Natural Products Chemistry & Research, Herbal Medicine: Open Access, Traditional Medicine & Clinical Naturopathy, Pharmacognosy and Phytochemical, Phytochemical Analysis, Phytochemicals. Anti-bacterial are the agent that interferes with the growth and reproduction of the bacteria. Anti-bacterial are used to disinfect surfaces and to potentiate harmful bacteria. Heat, chemicals such as chlorine, phenols etc. and anti-bacterial drugs have anti-bacterial properties. Anti-bacterial journals covers the topics related to growth and reproduction of the bacteria. Microbiology, Anti-Microbial Agents, Bacteriology, Global Antimicrobial Resistance, Antibiotics, Herbal Anti-Bacterials. Anti-inflammatory drugs are the substance that suppresses or inhibits inflammatory responses of an allergic, bacterial, traumatic and anaphylactic origin or in other words can be described as agents that control or reduce inflammation. . An anti-inflammatory drug includes corticosteroids. Anti-inflammatory drugs are sometimes combined with anti-biotic drugs. Anti-inflammatory drug journals deals with the drugs that are used to reduce inflammation. Medicinal Chemistry, Anti-inflammatory effects, Anti-inflammatory Medicine, Neuroinflammation, Anti-Inflammatory Drugs. Amino acid is a organic compound containing both carboxyl and amino group. Amino acids are building blocks of proteins and proteins play a crucial role in almost all biological processes. A large proportion of a cell is made up of amino acids. Amino acids also have influence on functions of organs, glands, tendons and arteries. Amino acids journals deals with functioning and importance of it. Amino Acids, Amino Acid and Immune Function, Archive of Amino Acids, Amino acids and immune function, Global Health, Metabolic Syndrome. Unani is the Islamic traditional medicine based on the teachings of Hippocrates, Galen, and Avicenna. Unani is based on four humors: Phlegm (Balgham), Blood (Dam), Yellow bile (Safra) and Black bile (Sauda). Unani is a part of Tibb e Nabuvi. Unani is an age old traditional system of medicine which utilizes herb, minerals and animal extracts in treating diseases. Unani journals deals with islamic way of treatment in curing diseases. Natural Products Chemistry & Research, Herbal Medicine: Open Access, Traditional Medicine & Clinical Naturopathy, Unani Siddha and Homeopathy, Unani Medicine, Advanced Research in Ayurveda, Yoga, Unani, Unani – Research and education. Homeopathy is a medical science developed by Dr. Samuel Hahnemann (1755-1843), a German physician. Unani is a system of complementary medicine in which ailments are treated by minute doses of natural substances that in larger amounts would produce symptoms of the ailment. Homeopathy journals deals with use of complementary medicine in the treatment of diseases. Natural Products Chemistry & Research, Herbal Medicine: Open Access, Traditional Medicine & Clinical Naturopathy, Homeopathy & Natural Medicines, Research in Homoeopathy, Unani, Siddha and Homeopathy.